It's the humour in tragic-comic novel Don Quixote that has helped Miguel De Cervantes story become so iconic. 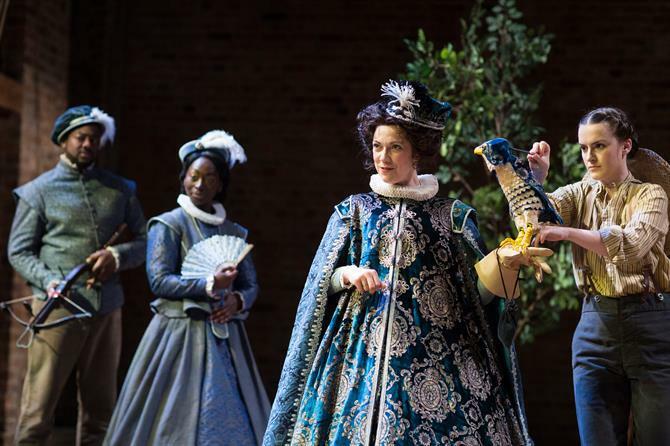 With that in mind, a new version of the Spanish classic from the Royal Shakespeare Company(RSC) stars two lead actors who are acclaimed for their comedy performances. 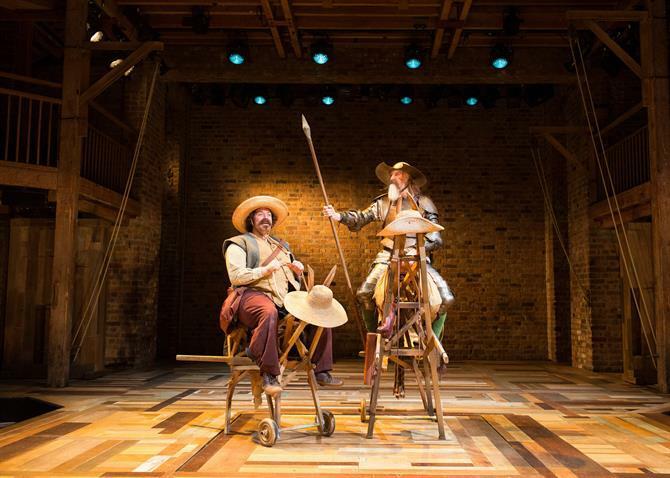 The RSC's Don Quixote stars comedy performers Rufus Hound as Sancho Panza and David Threlfall as Don Quixote. 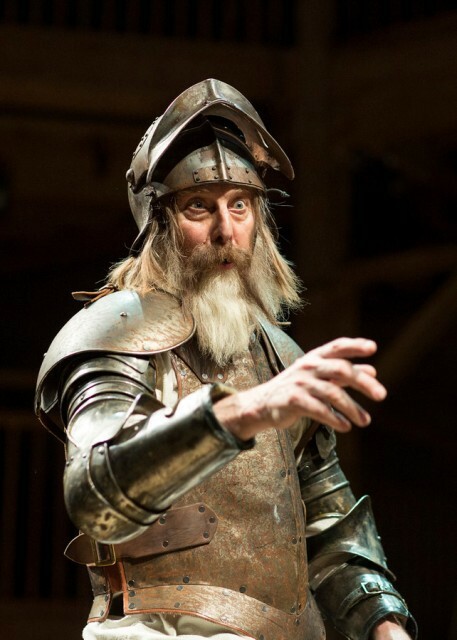 David Threlfall, who has become a household name for his award-winning performance as Frank Gallagher in Channel 4's comedy Shameless, takes on the lead role of Don Quixote and is no newcomer to the RSC. There's been a wave of excitement over his return as Threlfall's previous turn as Smike in The Life and Adventures of Nicholas Nickleby in 1982 earned him a Tony Award nomination for Best Actor (Featured Role - Play) when the production reached Broadway. That was a role he reportedly found so taxing, that he needed a year off from acting to recover. If this production goes well, hopefully he won't stay away from the stage for too long. At his side as Don Quixote's devoted but hapless squire Sancho Panza, is comedian Rufus Hound. He has a natural rapport with the audience and interacts with them frequently in a style that makes you think he is sometimes ad libbing. He's refreshing and fun, setting the tone early on when he toys with the crowd. The epic tale of Don Quixote is about an ageing man and lover of adventure novels, who suddenly believes himself to be a knight. With his changed view of the world, he sets off on an ill-prepared incredible journey around Spain with sidekick Sancho Panza. They encounter scrape after scrape due to Quixote's "madness", earning themselves notoriety. Where there are windmills, he sees giants; a flock of sheep is an army of warriors; and monks praying are spies to be fought off. To recreate these images, there's a lovely use of puppetry, costume or set design, which involves a huge revolving windmill being quickly built on stage. 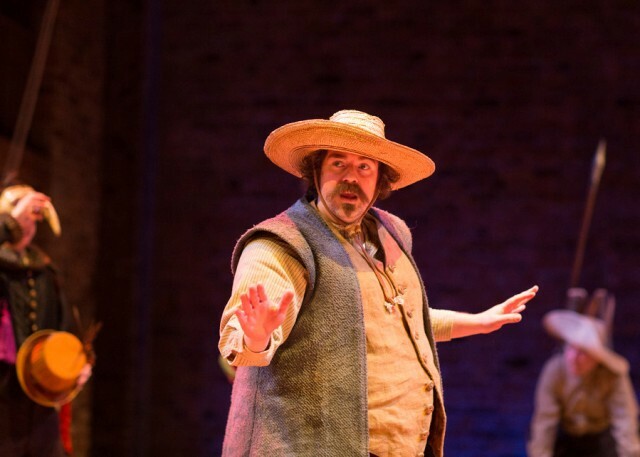 This Don Quixote production at Stratford Upon Avon's Swan Theatre has been directed by Angus Jackson, following on from his scintillating production of Oppenheimer for the RSC in 2014 and 2015. Jackson has once again got the balance between drama and emotion just right with another impressive, endearing production. Despite some of the violent and humiliating encounters by the pair, Jackson overall plays this story for laughs, moving on to sentimentality towards the close of the play. There's also a touch of Monty Python about it with the main characters emblazoned in armour and riding wooden contraptions pulled by a rotating stream of actors over-acting delightfully as the horse and donkey with swaying tails and chewing mouths. But no-one can out-do Threlfall. With long white beard, a barber's wash basin doubling as a helmet and a wistful voice, he is a striking presence on stage. Immersing himself fully into the role, the 62-year-old actor doesn't disappoint and has created a wide-eyed, aspirational Quixote. His desire to feel free is infectious, rubbing off on Sancho Panza, and along the way, the audience too. Meanwhile, Hound makes for an able comrade in arms. He brings out a likeable, child-like naivity in Sancho Panza and watches practically open mouthed every time his boss gets into various troubles. Troubles like when the pair are used mercilessly for sport by a heartless Duchess, played with wonderful humour by Ruth Everett, who takes funny walks to a new level. It's just one of the many comic touches in a Don Quixote that emphasises the wit and slapstick nature of this tale, but doesn't shy away from its sentimentality. Leading with actors whose forte is comedy is a master stroke, but none more so than bringing back Threlfall to the RSC. Don Quixote coincide with the 400th anniversary of Cervantes' death, who died at the same time as William Shakespeare. Tickets cost from £5 from the RSC website or by calling 01789 403493.